I wanted to eat sweet potatoes with andouille sausage. Why hadn’t I gotten to have any? (Oh right, I live in a different state, shoot.) I want it now! … My food-brain intercom sounded rather a lot like Veruca Salt was in charge at that moment. 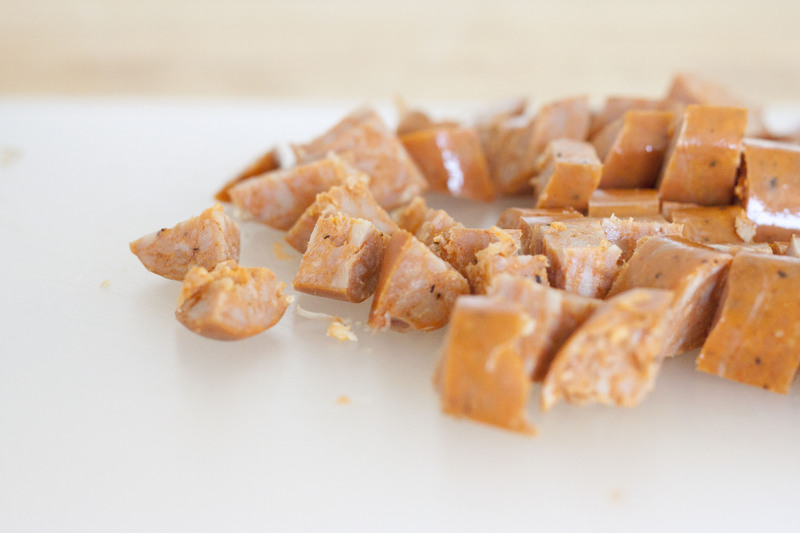 But, I pulled myself together and quickly realized, hey, I could just make sweet potatoes with andouille sausage myself! Easy! Easy, and delicious! This is something of a cross between a hash and a big pan of roasted vegetables. The sweet potatoes, onion, and sausage are all chopped small so you can get a good mix in each bite. Roasting brings out the wonderful underlying sweetness of the potatoes and onion, and then I figured the sausage could just roast in there too, to save on clean up. The smokey spiciness of the sausage adds a richness and liveliness to the mix and provides a nice counterpoint to the sweet potato. I think chorizo would work fabulously too if you wanted an alternative to andouille. And, I sprinkled the sweet potatoes with just a pinch of smoked paprika, to echo the flavor of the sausage and unify the flavors. I threw in some handfuls of spinach at the very last minute to bulk the dish up. You could skip this step, but I thought it added a nice freshness and contrasting crunch to the other ingredients. These sweet potatoes would make a nice side dish for any barbecued meat or any main dish with Cajun or Spanish flavors. But, I actually found it filling enough to be a light meal on it’s own. And, being that it’s only a baby step away from being a hash, it is, of course, quite tasty with a poached or fried egg perched on top. Wash the sweet potato – no need to peel, just remove any icky spots – and cut it into small cubes (about 1/2 inch). Peel and dice the onion. 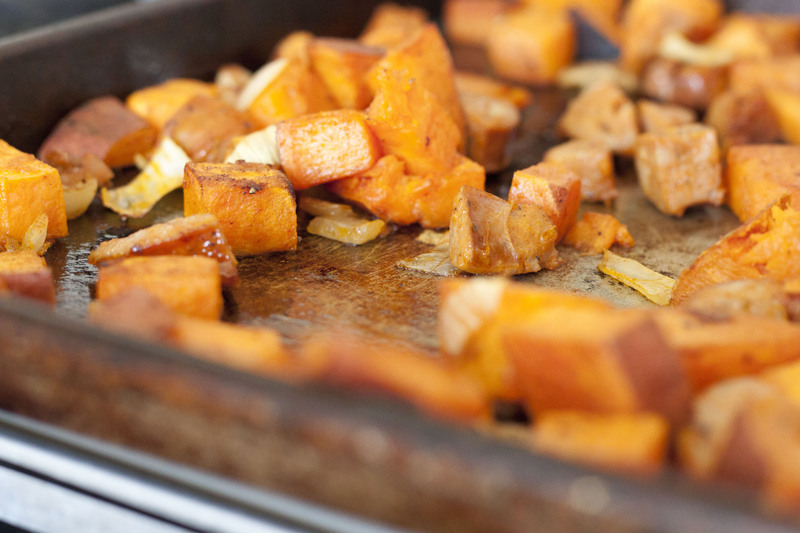 Toss the sweet potato and onion with the olive oil and paprika and sprinkle with salt and pepper. Spread on a baking sheet or in a roasting pan and pop into the oven. Stir the sausage in with the roasting sweet potato and onion and let roast about 5 minutes more or until the sweet potato pieces are quite soft when poked with a fork. Remove from the oven and toss the hot mixture with the spinach – the spinach should just lightly wilt – transfer to a serving bowl and serve! Hash is one of my favorite things, and I make one very similar to this. 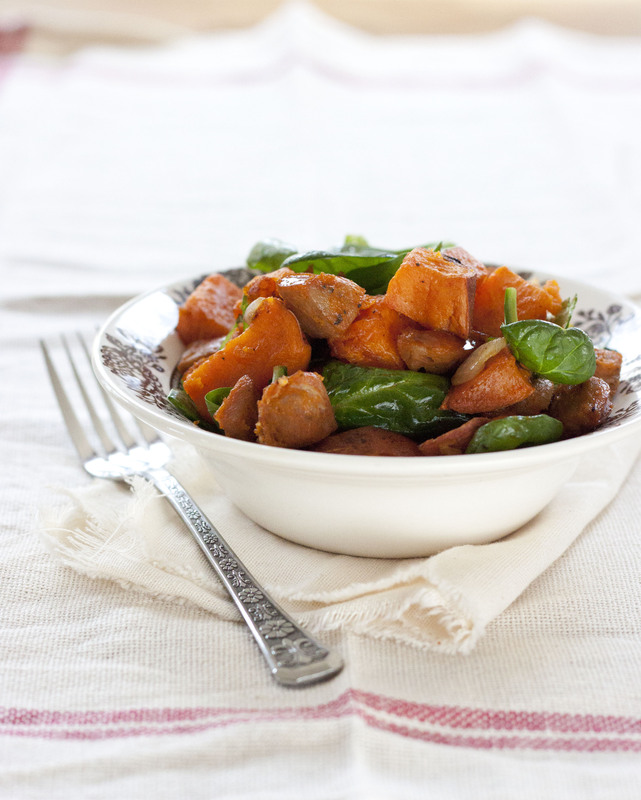 Sweet potatoes and sausage — what’s not to like? I often have feelings of “buyer’s remorse” when it comes to food. It’s not that I didn’t like what I ordered, but rather I just want mine plus everyone else’s! Food greed, perhaps? 🙂 Nah, I just love food. I don’t actually eat meat but your photography is great. Just discovered your site :). Thank you! 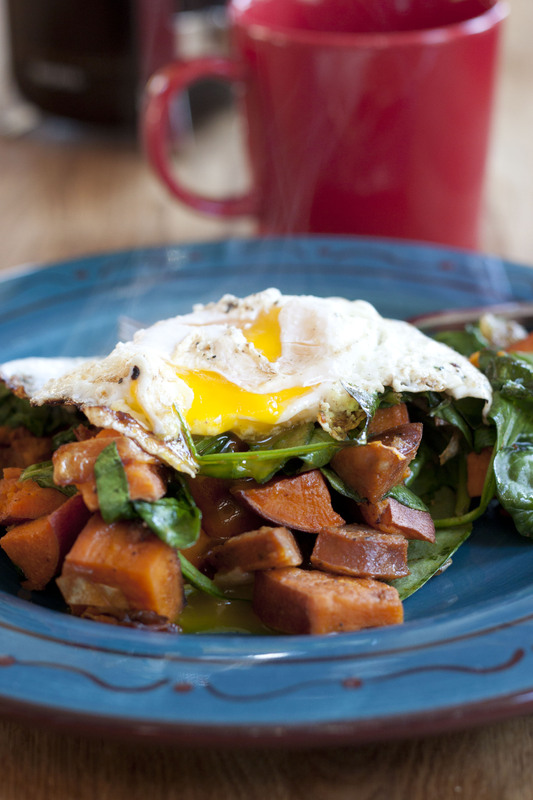 And, to substitute for the sausage, I bet the paprika roasted sweet potatoes and onions tossed with the spinach and then some chickpeas, plus a little extra drizzle of olive oil and maybe a dollop of plain yogurt would be really good. was this restaurant the Green Goddess in New Orleans? I’ve had Louisiana Bangers & Mash (this recipe-ish) there before and did not regret a thing. Their entire menu is filled with enviable dishes. Hmm, no. This was some restaurant in Minnesota, actually. But now I really want to go to the Green Goddess! Sounds amazing! This has got to be one of the most perfect dishes I’ve EVER seen! Seriously, not only do the colors pop right off the screen, but I can just imagine that the flavors are so perfectly balanced…this would be sublime. I’ve just recently started enjoying sweet potatoes, I wasn’t a big fan before now. But for some reason, lately I’ve really been loving them. I so wish we could get decent sausage here in Saudi Arabia, because I know that this is the first meal I would make with it! Thank you! I’m sorry to hear you don’t have access to good sausage in Saudi Arabia – as a Scandinavian, I don’t know if I could handle it! :) But, even without the sausage the spiced sweet potatoes and onion are good. You could add in some sauteed mushrooms at the end, I bet that would be good too! Oh wow, I wanted to make this before I even saw the egg. I love how colorful your food and photos are. Thank you! And don’t you just think that nearly anything that is delicious is even more delicious with a runny egg on top?! Just tried this tonight, no leftovers! Great flavor combinations. I think it’s from a restaurant named Brasa in Minnesota… if it’s not i got to say that this recipe comes close to what i had!!! Brasa is an amazing and i must say AMAZING place to eat!! I’ve been looking for a recipe similar to theirs!!! Thank you for sharing this!!! I’m so glad it worked well and that you liked it! And, now that we’re in Minnesota, we’re definitely going to have to go and check Brasa out! 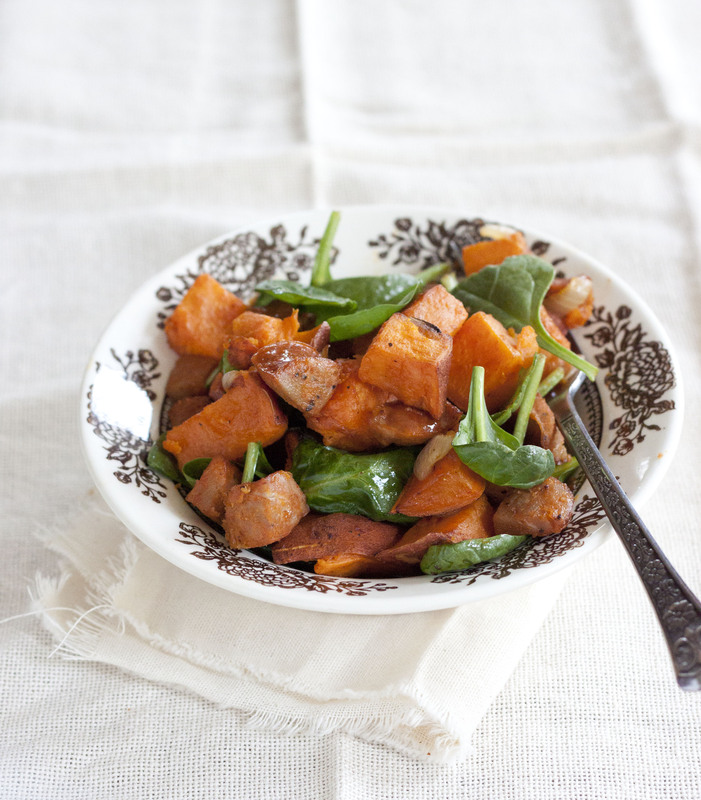 You are currently reading Sweet potatoes with andouille sausage at Five And Spice.